Pope Benedict XVI has secured his place in history. But not perhaps as he might have wanted when he was elected in 2005. 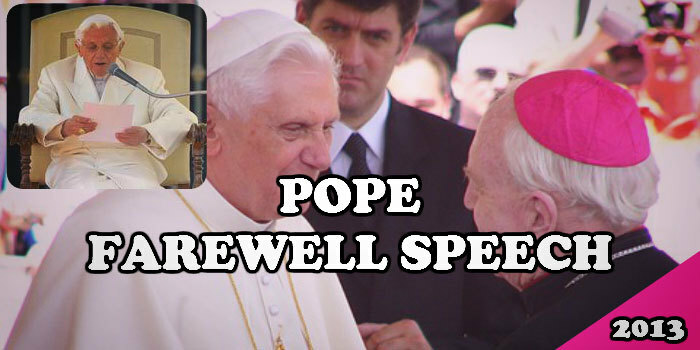 He’s the first Pope to step down from the office since Pope Gregory XII in 1415. Quite some time ago. But age, illness and tiredness appear to have caught up with the 85 year old German Pope. That and the continued wave of scandal that seems to engulf the Catholic Church daily. With 115 cardinals due in Rome to elect a new Pope at least one of them, Cardinal Keith O’Brien of Scotland, won’t be making the trip. He’s stood aside whilst investigations into improprieties continue. But that aside, we had a Pope farewell speech to look forward to. No, he’s made of sterner, more devout stuff. And that was evident today as his unexpected resignation culminated in his farewell speech before an enormous audience in St. Peter’s square–an audience drawn from all around the world. He was evidently tired as he gave his emotional farewell speech to his audience. This was never going to be a moment for great rhetorical display, let alone any surprises. Of course, the next Pope will deal with any surprises when he’s elected in time for Easter. Happy Easter your Holiness. There were moments of joy and light but also moments that were not easy … there were moments, as there were throughout the history of the Church, when the seas were rough and the wind blew against us and it seemed that the Lord was sleeping. His audience heard some good metaphorical reference that’s never surprising with such a speech. But the reference also placed his own particular difficulties into a continuum of Papal history. There have been difficulties before and his Church has responded and recovered. I will continue to accompany the Church with my prayers, and I ask each of you to pray for me and for the new Pope. His resignation from the Papacy was truly historic. His farewell speech certainly won’t have the content to survive time but the moment he said farewell will be remembered for a very long time by his flock. Whether it’s a retirement speech or a leaving speech you can boost your public speaking confidence with coaching. Because a one-to-one public speaking coaching session will give you the skills and confidence to be successful with your speech. Please don’t hesitate to call us when you feel the time is right to invest in your skills.